Home Reviews Crudo! Gurgaon’s Healthy, Yummy – Liquiteria! I will ask a question, the answer to which can benefit a lot of runners, cyclists, swimmers, yogis in the NCR Region!!! How many food places in Gurgaon do you know are run by a marathon runner and fitness/ health freak?? I found just the place! A place I don’t have a comparable experience for perspective in the NCR region. Crudo! 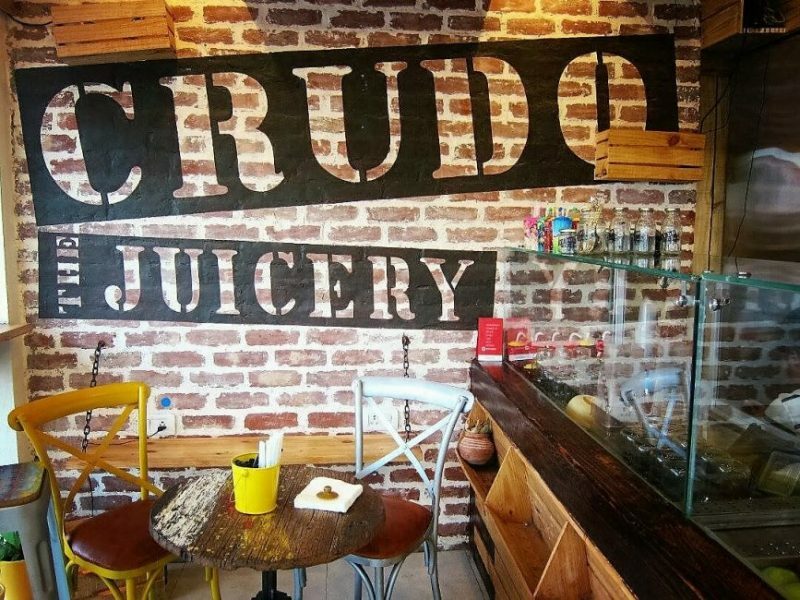 Run by the Sydney returned Amit Sahni, Crudo is a simple concept of healthy, fresh, hygienic smoothies, shakes, cold pressed juices offered in place good enough to sit and talk! Outdoors and indoors!!! The menu includes the fancy and fresh cold-pressed juices, nuts and berry abundant smoothies, fresh homemade hung curd yogurts and smoothies, salads and shakes! Incredible blend of health, taste and quality, this place kicks smoothies up a notch with berry (yes they do actually put them) toppings and combinations. People with dietary restrictions would really like their preparations and I couldn’t be happier with the way they handled my special requests. The drinks are meticulously prepared. If you ever feared the green juices, then definitely try My Diet – It’s their yummy Green Juice with a whole lot of goodness of kale, spinach, amla! It’s a myth buster on the available green juices! My special recommendation for the all those Fitness Enthusiasts is the Beets and Treats! Why? Because from the very obvious beetroot, it has the unusual red cabbage and pineapple contents too! Quite different, no? There is definitely a deal different about cold-pressed juices! The person in-front of me at the counter ordered Crudo Delight! He said it was his “to-go-to” drink at Crudo. I moved from trying at least two kinds of smoothies, two kinds of salads and one shake (speaks not only of my apetite, but also how light the preparations were)! In the fruit salads – Tuttyfruity is my all time favorite – the poppy seeds sprinkle on it is so novel! While I have my favorites, there is just enough to experiment. My big concern about this place was how do they keep the freshness of the fuits and green leaves intact given the humid and hot weather we are in. It’s not easy to dish out and tout the freshness of fresh fruit juices in the sizzling Gurgaon! To figure this out they have invested in big cold storages and keep a menu which is not huge! Today Crudo is a hit amongst the fitness community of Delhi and Gurgaon. It’s a an early morning post-run hangout! For the cyclists who do long distances, they unwind at Crudo many a weekend afternoons. And for all those finicky calorie counters, this place serves you well by not blowing your workout efforts on a morning/ afternoon or an evening snack! They have delivery options which is actually faring very well mainly because of their neat packing. Just a few good things of each which help to keep it what they promise! And that’s what brings me to liking it and recommending it to my friends! It’s an ideal outing not just for fitness lovers but also kids who love their juices! I for one have brought my kids many times especially on days when we don’t want food court kinda food or the mall indulgences, but just a simple fresh juice that their mommy didn’t have to work hard enough for! Well you already know that I am nutty, crazy and mad about good healthy food! What is Happy Feet all about?